The former wife of radical Muslim cleric Abu Hamza al-Masri has revealed she fears for her life after receiving death threats from his supporters. 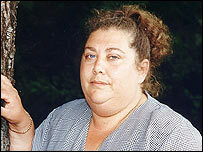 Valerie Fleming met and married him in 1980 when she was 26 and he worked as a receptionist in a London hostel. She told the Times that, despite the many years since their separation, his followers had threatened to kill her if she spoke out against the preacher. Abu Hamza was jailed for seven years for inciting his followers to murder. After forging a relationship the couple had a son, Mohammed, but the marriage broke down four years later. "If I had never met this man, had a child with him, married him, given my life to him, then maybe I would have taken a different path, and so would my children," she said. "He is always there, despite the fact that I want to forget him." Ms Fleming, a Catholic of Spanish origin, said their marriage began to falter when she worried that Hamza was flirting with women at the West End nightclub where he worked as a bouncer. In a turning point, he promised to dedicate himself to Islam in a bid to alter his behaviour, prompting them to attend a small mosque in London with their children. And that year, Hamza asked if he could to take their three-year-old son to Egypt on holiday, saying his father was ill.
Ms Fleming did not see her son again until around 15 years later when she found out through the media that he was on trial in Yemen on charges of plotting a bomb campaign against British and American targets, she told the Times. Ms Fleming saw her ex-husband on television in 1999 after he had reinvented himself as a spiritual leader. "I could not believe it," she said. "Where has Mostafa gone? What is this that seems to have replaced him. "I could not believe what he was saying, all this stuff about Islam, or that he was living in London, just 40 miles away from me." Now re-married Ms Fleming says she regrets ever meeting her former husband.